In the matter-antimatter plexing of the stasis phase inducer, we noticed a set of distortion wave theorems that mixed into the containment field. The crew continues to pursue some mysterious aliens who are going back in time on Earth to take the life energy of humans for their own sustenance. Mark Twain thinks the crew members of the Enterprise have come from a different time or place to try to destroy his own time period, and gives pursuit. As he confronts the crew, the aliens make an appearance and the crew gives chase, leaving Picard and Guinan behind. Ultimately, the threat is ended when the alien locale is destroyed and Twain is returned to his own time period. I vividly remember this two-part episode from when it first aired and I was little. It has stuck with me because of Mark Twain, I think, but also the weirdness and mixture of genres and ideas. Sometimes this is good, and sometimes it’s not so great. I quite enjoyed the setting and the ways that Picard and crew tried to play things off like they were a crew preparing to put on a Shakespearean production. Those scenes were delightful, and it was also fun to see how they tried to cope with the challenges of a different era. On the other hand, there are plenty of question marks throughout the episode. It’s hard to accept the notion of an alien race that relies entirely on eating the life energy of humans to survive. How have they continued for any amount of time? Mark Twain was really annoying again, in my opinion, though he did manage to redeem himself somewhat by the end. Also, when did Guinan-Picard become a weird “maybe more than friends, but unsure what that means” type of relationship? They’ve talked a few times, yes, but although it seems clear Picard takes her advice as rather weighty, it has never seemed suggested that they go beyond that. It just felt a bit weird to have this dynamic suddenly introduced. It’s weird, and if I recall, a two-parter that is largely disliked by fans, but I didn’t think it was too bad to be honest. It was cool to see how the time loop got tied off and how Data’s head ended up in the past alongside some other objects. Lieutenant Barclay is afraid of transporting, and after he finally convinces himself to get transported over to work on a problem with La Forge and others, he is seemingly attacked while in mid-transport. It turns out that he isn’t just hallucinating, despite his own conviction that he might be suffering some kind of mental disorder, and something really was in the matter stream with him. He ends up rescuing a few crew members that were stuck in mid-transport. “Realm of Fear” has a different feel than the episodes that have come along recently. It’s… campy. There is also a lot of fake techno-babble, as I tried to convey in the caption of the picture shared here. I like Barclay. I think he’s a fun character, but it seems like they never quite know how to use him. He’s so normal that the writers must feel some perceived need to make everything around him abnormal to make up for it. But the story of having just a Joe Schmoe on board the Enterprise and trying to make do is enough. It would be great to see an episode kind of like “Data’s Day” for Barclay, but again with less drama happening around it. What is it like to not be the super-person that all the rest of the main characters seem to be? That’s the Barclay episode I want to see. This episode is just kind of weird. Alongside the slew of fake-techno-babble, we have the transporter working very differently from any way it has been portrayed before. The way that transporters work is never really explored in depth, but the amount of discussion already given it seems to work against the way it is conveyed here. We do, however, get to see how far along Geordi has come. He really does demonstrate his mettle as a strong leader, assigning teams to do things that he can delegate, supporting those who are struggling (i.e. Barclay), and the like. He’s come a long way from being used as a recurring attempted-love-interest joke. It’s good to see how well he is utilized now. As a huge Star Wars fan, who’s read 100+ Star Wars books and loved the movies since I first saw them, I have to say I loved The Force Awakens. I also know I don’t want to spoil it for anyone. Hence, consider yourself SPOILER WARNED. Yes, I consider just about any new information about a film a spoiler, and I don’t want to be the one to spoil it for you. So you have been warned, there are SPOILERS in this review. I, like just about everyone else I know, have been waiting breathlessly for the new Star Wars movie. Would it be good? Would Disney ruin it? Actually, I never had the thought of “Will Disney ruin it” because I figured the prequel trilogy was already not so great, so it didn’t matter much if Disney did ruin it. I could just pretend they were apocryphal imitations of the Star Wars I knew and loved. Let’s just get it out of the way: I do not think this movie was ruined. I absolutely loved it. Is some of that the nostalgia they played upon? Absolutely. But does the film have genuine Star Wars feel? Totally. The Force Awakens is filled with nods to the original trilogy in particular. Some might not like this, but for me it was needed and welcomed. It is like Disney was giving us one big Wookie hug, reassuring viewers that yes, this is Star Wars, and it is back. Along with these nods came some meta-jokes and references to both the Expanded Universe and concepts that were never included or changed in the original movies. I appreciated this kind of fan service, but what I appreciated more was that they never took over the film. There was a stunning sense of newness intermingled with the sense of nostalgia here. Rey and Finn were fascinating characters (particularly Rey, who is totally awesome) with enough details of their backstories teased to get me quite interested in them in upcoming films. Other characters were tantalizing (like the First Order informant’s at Mox’s place, and Mox herself of course) enough to make me want to come back again and see some books based on them. Could we have a new Expanded Universe, please? The use of models and real sets (and real-looking ones) made this feel much more like the original trilogy than the prequels. The whole film was clearly Star Wars. The plot was also quite enjoyable, with the mystery surrounding Luke and Kylo Ren driving the plot. Kylo Ren was not nearly as scary/powerful as he could have been. To be fair, part of this might be because they are clearly building him up. One scene featured him looking at the helmet of Vader and apologizing for feeling like he was tempted by the Light. His choice to kill his father was not unexpected in the flow of the movie, and could lead to him gaining more of a Vader-like persona in the rest of the trilogy. I loved the ending with Rey approaching Luke. Luke Skywalker has pretty much always been my favorite Star Wars character. My son’s name is Luke (in part because it is also my favorite Gospel). The music was good, though at times I barely noticed it. I think part of this was because unlike watching and re-watching the previous films, I had to pay attention to the plot the whole time. Every time I noticed the music, I enjoyed it immensely. I loved The Force Awakens and cannot wait to see where the series goes next. Sign me up for the rest of the movies immediately. Star Wars: The Force Awakens- A Christian perspective– I offer a worldview-level analysis of the film from a Christian perspective. Welcome to your new home, where you will spend the rest of your life only to wake up and realize it’s all a dream kind of. A strange probe is found in the middle of space and when the Enterprise draws near, it seems to attack Picard. As the crew tries to figure out what happened to him, Picard wakes up in a completely different world, complete with a wife and a society in which he exists. Initially perturbed, he attempts for years (!) to figure out what happened, and slowly comes to integrate himself into the agrarian society. Meanwhile, only minutes are passing on the Enterprise as they track the probe’s flight path back to a system devoid of life–apparently a star went nova, burning out any life forms in the area. Picard in the other world grows old, has children and even a grandchild, and then is asked to come see a rocket launch. It turns out the rocket was launching the probe that has passed on the memories of the system’s people and society to Picard because they knew they would all be destroyed. Picard wakes up back on the Enterprise having lived a lifetime elsewhere. The sheer scope of the episode is astounding, as it tells the story of the culture and people in snippets that make one envious of the way they’ve organized society. Thinking about the episode makes it really tough to think that anyone other than Picard could have taken the overwhelming mental toll that living an entire life in minutes could take on him. Do the memories continue to haunt him forever? How real are they to him? How does he sort out the real from the complete other life he lived? Patrick Stewart puts this episode on his shoulders like Samson put the city gate of Gaza on his back and carries it in the most epic possible way. The episode was absolutely sold by Stewart throughout, as viewers are sucked in by his performance. He never seems to fully give up the notion that his real life was indeed his real life, but he ultimately settles into his alien life–as any of us would. The society created for the episode seems utopic, but not over-the-top. It is easy to see how Picard eventually could have felt comfortable settling in. The characters are all robust enough to make you care about them, even if you know they are all just one-offs. It’s just really well-done. The final scene in which we see Picard get delivered the flute and begin to play with it–a nod to the fact that he has just experienced an entire lifetime of an alternate universe–was both hopeful and terribly sad. Perfection. “The Inner Light” is, in my opinion, one of the best pieces of television out there. It is just absolutely phenomenal. Data’s head is discovered in a dig site on Earth–from hundreds of years prior to the “current” time in Star Trek. The crew discovers temporal distortions that lead them to believe some malevolent time travellers are going back in time on Earth. They try to protect Data but he is the only one capable of spying on the different time period and then inadvertently gets sent back to San Francisco in the 1800s. There he finds that Guinan is among the literary elite–but it is actually Guinan several hundred years ago so she isn’t cognizant of everything that is happening. 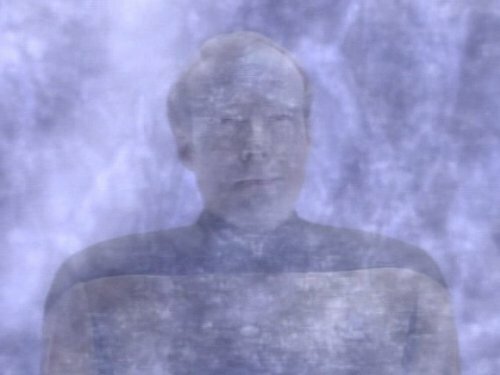 As Data and the crew try to reunite, Mark Twain spies on them, thinking they are part of an alien plot. If I recall correctly, this two-parter is hated by many TNG fans. Frankly, I didn’t think it was awful. It was just ridden with plot holes and unexplained things. Well, plenty of things were attempted explanations but the answers to “why” and “how” questions provided were not very satisfactory. How does the crew so easily go back in time when before only Data could handle it? And why is Mark Twain so annoying? I’m going to sidetrack here for a second and say that when I was young my family would visit my Grandma in Quincy, Illinois and cross the border to Hannibal, Missouri every year to visit the various Mark Twain tourist locations that were available. It was a great time that involved all kinds of fun with caves, sluicing for rocks, and literature. I fell in love with Twain and the lore around him on these trips. All of that said, I can honestly say that if he was this annoying in real life he was a real twit! Goodness, they did not really pull out any stops! There is also a bit of difficult, in my opinion, with the overall plot. It just seems a bit strange that the aliens would pick the time they went back to out of all times in human history to eat humans. Maybe some of the weirdness will be cleared up in the next episode. The needs of the many… wait a second! An injured Borg is brought aboard the Enterprise, causing all kinds of chagrin among various members of the crew. As Dr. Crusher treats the Borg’s injuries, the crew tries to come up with a way to turn the Borg into a kind of silent bomb that would introduce a virus into the collective. They discover, however, that the Borg has learned identity as Hugh and “I.” The Borg, in other words, has in some way un-assimilated. Ultimately Picard and crew decide not to have him used to destroy the entire collective but rather hope that his re-assimilation will possibly share individuality with the Borg. But seriously, this one is about a Borg’s assimilation into non-Borg society (see?). It’s quite compelling to see how the Borg act outside of being simply single-minded assimilation machines. Guinan’s character provided some balance to the other side, pointing out that the Borg show no sympathy and simply will continue unless impeded for all time. However, once she herself confronts Hugh, she seems not quite as ardent about the need to utterly wipe all Borg off the face of the universe. What makes this episode so surprising is that it actually gets you as the viewer to empathize with a Borg. That is a true feat that is worth mentioning. It is hard to not still feel as though the smart thing would have been to eliminate the Borg, however. 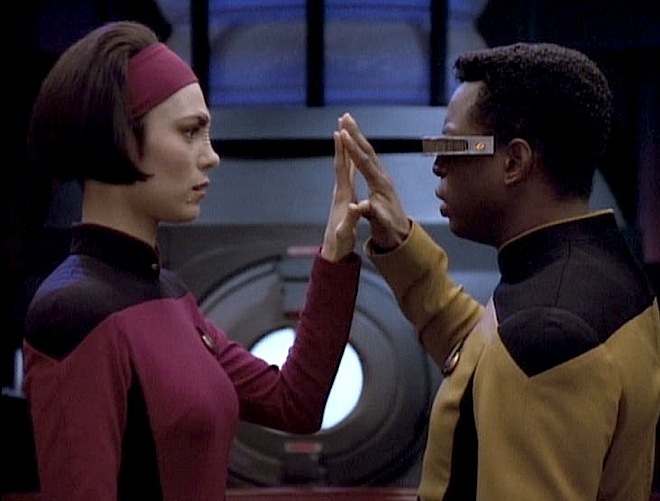 Hugh turned to Geordi at the end, indicating that even after his reintegration into the Borg, he seemed to possess some sense of individuality. It will be interesting to see whether that impacts any future episodes at all or whether it is ever brought up. I can’t honestly recall it having any impact in Voyager or later in TNG, but I’ll try to keep my eyes open now that I’m watching them all in order. The main complaint I had about this one is how hard it was to swallow the speed of the transition. Hugh is almost too human at points and it is surprising how quickly the transition takes place–and the crew’s buying into the transition is just as speedy. It’s a TV show so these things have to happen quickly, but it still felt rushed. As the Enterprise assists a Romulan vessel that had an explosion, a transporter accident leads to the “death” of Ensign Ro and Geordi. The two crew members, however, are not dead but rather “phased” into a different level of existence. They are able to walk around ships, but also through walls. They are invisible to the crew. As they try to figure out what happened, they uncover Romulan subterfuge that would potentially lead to the destruction of the Enterprise. On a race to get themselves phased back into normal existence, they are pursued by a Romulan crew member who also suffered the same fate. Ultimately, they manage to send the Romulan hurtling through space and reappear at their own memorial service, saving the lives of everyone aboard the Enterprise. Wow, this one came out of left field! I remembered really not enjoying this episode before, and I think it is because of the dialogue between Ro and Geordi. Some time ago when I saw it, I interpreted it as an attack on religious sensibilities. I, being very religious, was offended. Now, I being still very religious, realized that it was more a thoughtful discussion of the interplay between religious beliefs and their correspondence with reality. It was an interesting angle that was explored through Ro’s beliefs, and it actually seemed like it strengthened or reawakened her faith rather than jettisoning it. The mystery surrounding the episode is very intriguing. Even without the raised stakes of the Romulans trying to destroy the Enterprise, there is plenty of suspense here. What would it be like to not be able to talk to anyone around you? What would you feel like if you just passed through everything and no one ever could interact with you? What would you do? The questions aren’t really explored, but I can’t help wondering about them. It’s part of what made this episode so good. The race to save the Enterprise alongside being “phased” back into existence was great, and the scene in which Geordi tries to get Data to realize what is happening was absolutely delightful. The writers were able to mix some humor into the seriousness of the episode, while never losing the urgent tone. It’s a really awesome episode. Also, can we officially say that Geordi has massively stepped it up? He’s had some good episodes in the past, but now it’s like every episode he has a major role in is fantastic. Way to go La Forge!